We caught a Lidia Bastianich program on PBS last night that had a recipe we knew we were making immediately – eggs poached in a marinara sauce served on toast. I mean… how perfect could something possibly be?!? 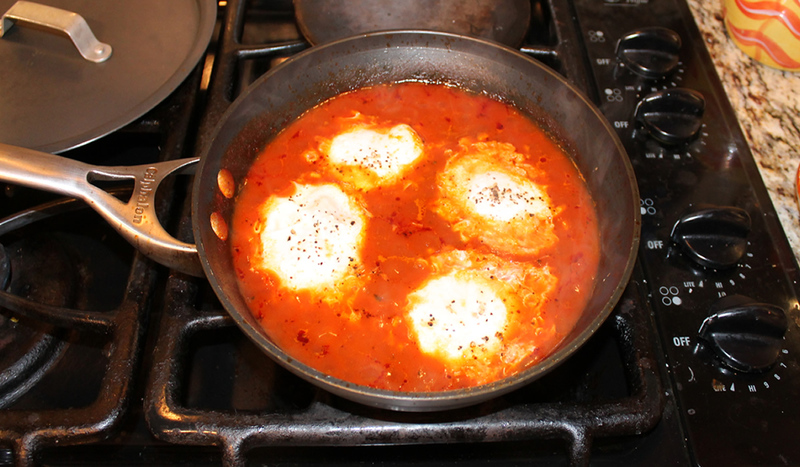 The premise is simply to heat the sauce in a shallow pan, crack the eggs in, cover, and simmer for a few minutes until the eggs are cooked to your liking. Serve on toast. She made a quick fresh tomato sauce – we had some in the freezer. Even easier. To make it a complete dinner, I added some grilled sausages. Our CharBroil Grill has seen better days, so last week I ordered new heat spreaders, new grill racks, and a new warming rack to hopefully get us through another season. They arrived today via FedEx – with a damaged box and one of the three grill grates missing. I went to the CharBroil website and sent off an email. In less than 20 minutes, I had a phone call from CharBroil and a replacement grate was on its way. Twenty minutes! I was dumbfounded. The woman I spoke with – Elizabeth – was on top of it, immediately. No hoops to jump through, no questioning my motives… Just honest quality customer service. I really was impressed. Needless to say, when it does become time to get a new grill, CharBroil will be the brand! Perfectly-grilled sausages and perfectly-runny eggs poached in marinara sauce and served on toast and a wonderful customer service experience. In spite of the fact that it’s been raining all day, I’d say today has been a success!